OK, so the whitefish on the episode didn’t turn out…at all. Luckily Art had everything he needed for one of his signature dished, wild rice! We know most people won’t have moose lard or the inner bark from a young birch tree, so you may have to improvise a bit on this on. • Bring water or stock to a boil with the birch bark until you have a birch tea. • Remove the birch bark then add the animal fat, salt, syrup & wild rice and bring back to a gentle boil. • Boil the rice until moisture is absorbed and rice grains have split open. Add more liquid if needed. 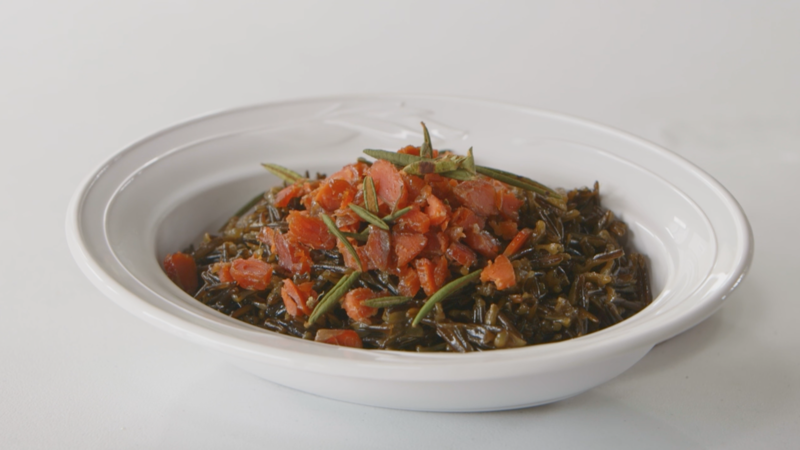 Wild rice can take up to an hour to cook. • When rice is done, drain off any excess moisture and fluff up with more lard. • Crumble up the smoked fish and place in a small bowl or plate. • Serve the rice by heaping a pile on individual plates and topping with a handful of the dried fish. This is a great way to stretch out a small amount of dried fish and can be your saving grace when you screw up a main course of fish!